The King Koil Spinal Guard Luxury 6' Divan Bed - the original King Koil Bed - was developed with the co-operation of the US International Chiropractors Association. Still a winner today, this Bed provides enhanced spinal care and unrivalled posture support. The King Koil Spinal Guard Luxury 6' Divan Bed is described as the 'Original Bed' in the King Koil Collection of Luxury Beds and Mattresses. Developed with the Co-operation of the US International Chiropractors Association, this Firm Support Bed provides Enhanced Spinal Care and Unrivalled Posture Support. Combining a High Guage Heat Tempered Open Coil Spring System with Chiro-Span Posturisation™, which targets extra back support in the centre third zone, the mattress also benefits from a Perimeter Frame with Flex-edge Border Supports for full surface non-sag sleep comfort. 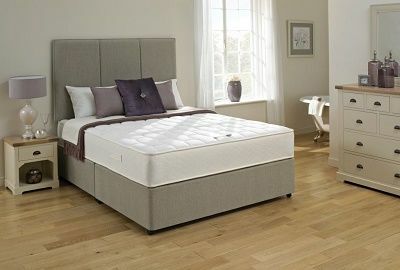 The King Koil Spinal Guard Luxury Super King Bed features Kaytex™ all over Body Support Foam with a Posture Support Zonal Pad for exceptional spinal support, and is complete with a Traditional Micro Quilted Top Layer. Available with a High Quality Platform Top Base with a Foam Layer on the Surface for Padded Comfort, the divan base comes with a Choice of Base Colours, Luxury Shepherd Castors and Drawer Storage Options. The King Koil Spinal Guard Luxury 6' Bed has the reassurance of a Substantial 10 Year Guarantee and benefits from Free Delivery* and Free Collection and Recycling of Your Old Bed throughout Northern Ireland, and Counties Monaghan, Louth and Dublin, in the Republic of Ireland.